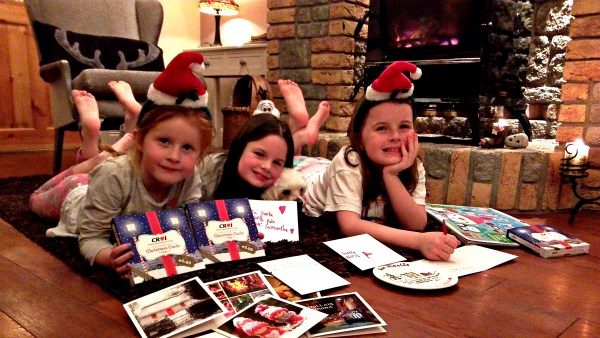 Croi Christmas Cards Hit the Shelves! Posted in NewsLeave a Comment on Croi Christmas Cards Hit the Shelves! 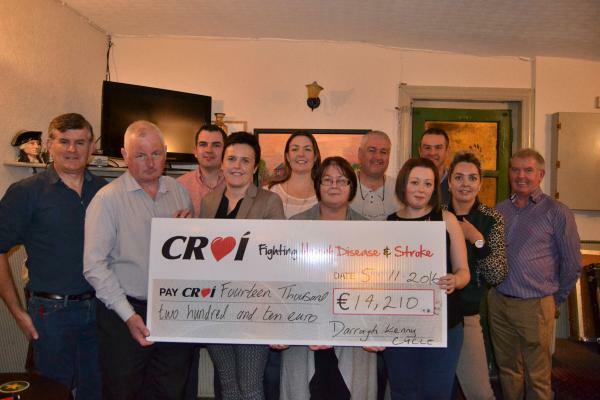 Croi Night Run Big Fundraising Success! 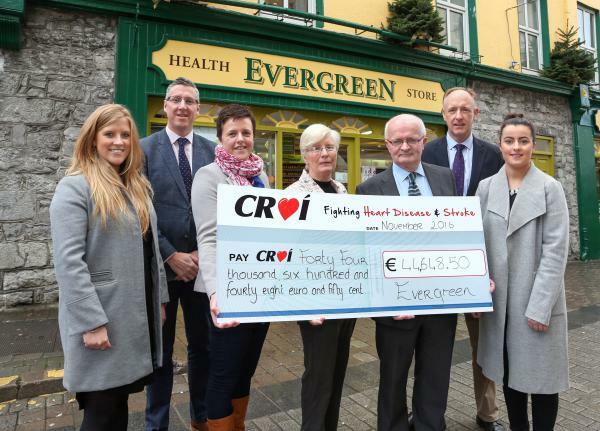 The recent Croi Night Run on the Prom which attracted over 1,000 walkers & runners has yielded over €44,000 for the Charity. “The event was a phenomenal success and we would like to say a big ‘thank you’ to everyone who made this possible, especially our sponsors Evergreen Health Foods” says Croi’s Neil Johnson. Posted in NewsLeave a Comment on Croi Night Run Big Fundraising Success! 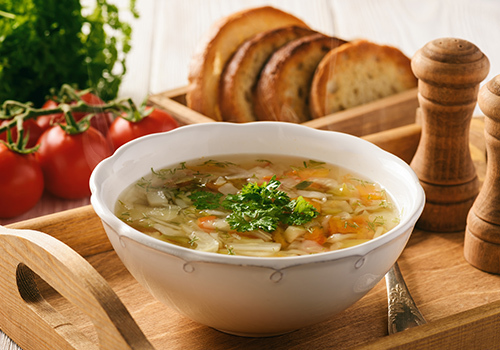 Vegetables are an essential part of a healthy diet but also taste fantastic, especially when made into soup. This soup is very easy to make – even if you have never cooked. A new report finds that treatment of Heart Failure is no longer a lost cause and recommends a framework to improve the lives of 90,000 affected by heart failure. Heart Failure is a serious, but forgotten, chronic condition which carries a huge cost of €660 million per year to Irish society. ​ Heart Failure is the leading cause of hospitalisations in Ireland1 yet just 7% of people in Ireland can identify symptoms of Heart Failure. 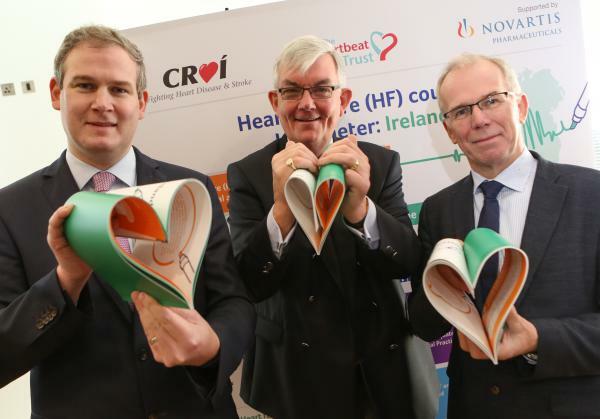 Pictured at the launch are L to R Minister Sean Kyne, TD, Dr. Ambrose McLoughlin, Chairman Heartbeat Trust and Kevin O’ Reilly Chairman Croi, Heart & Stroke Charity. Monday 21st November, 2016: The treatment of Heart Failure, a ‘forgotten’ chronic condition, is no longer a lost cause, according to the authors of a new report entitled ‘Heart Failure Country Barometer: Ireland’. The report outlines four key policy priorities and calls on the Government to implement this framework to improve the lives of 90,000 people affected by Heart Failure6. Minister of State for Gaeltacht Affairs and Natural Resources, Sean Kyne, TD officially launched, and contributed to, the report which, most importantly, provides solutions to this major health challenge which costs the state €660 million per year1. Heart Failure, a serious and often debilitating chronic condition, has a worse prognosis than many of the most common forms of cancer and can lead to poor quality of life for those affected4. Make Heart Failure a national priority: Explicitly mention Heart Failure within existing chronic disease policies and ensure there are sufficient resources to implement the HSE’s National Clinical Program for Heart Failure on a national level, with adequate funding for both GP and hospital care. Prioritise speedy diagnosis and treatment: Ensure that patients with symptoms of heart failure are diagnosed as early as possible, without delay. Ensure consistent and coordinated patient care: Create a coordinated, community-based national program between the hospital and community care at general practice level to provide patients greater continuity of care and encourage patient self-management. Increase awareness and understanding of Heart Failure: Support a national HF prevention program by raising public awareness of the risk of developing HF and ensuring access to high quality information and support for both the public and the medical profession. In Europe, 15 million people live with Heart Failure. Currently there is no EU-wide strategy supporting public awareness, prevention, diagnosis and management of Heart Failure. Strong leadership by European and national policy makers is essential to reduce the future burden of the condition. In October, a new Written Declaration on Heart Failure was launched in the European parliament, in partnership with patients, professionals and parliamentarians.Irish MEPs Mairead McGuinness and Nessa Childers are supporting the Written Declaration on Heart Failure. For more information, and to read the full framework of policy priorities, visit www.heartbeat-trust.ie / www.croi.ie / www.novartis.ie and follow #heartfailure #changeHFpolicy. 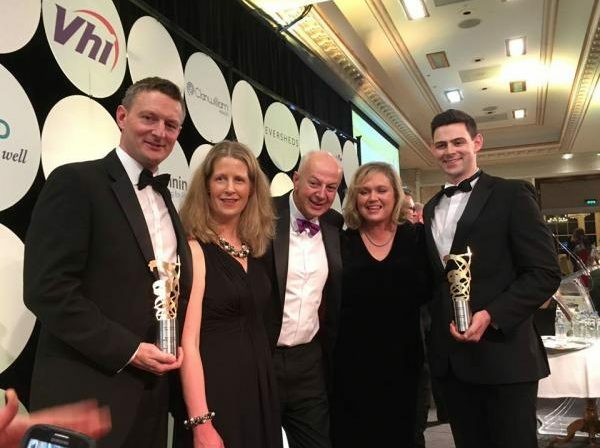 We’re delighted to announce that for the third successive year Croí have winners in the Student Project of the Year category as part of the Irish Medical Times Health Care awards. Dr. Liam Martin a graduate from NUI Galway won the prestigious award for his novel research entitled ‘The Galway Taxi Driver Study’ which he conducted as part of his MSc in Preventive Cardiology, a Croí, NUIG collaboration. The Croí CLANN (Changing Lifestyle through Activity and Nutrition) programme was a winner in the best patient educational category. The programme which is a collaboration with Dr. Francis Finucane at the Bariatric Medicine service is a dynamic 10-week intensive lifestyle intervention designed to help individuals achieve a healthy weight and shape. To date over 400 people from across the West of Ireland have engaged in this evidence-based programme, which yields very positive results across both lifestyle and medical risk factors. Pictured at the awards are (L to R) Dr. Francis Finucane, Ailish Houlihan, Croí, Bobby Kerr, Ainne Costelloe, Croí and Dr. Liam Martin. We all need a small portion of fat in our diet, but fat is considered to be less healthy than other nutrients as is can raise our blood cholesterol, increase our risk to heart disease and are high in calories which can lead to weight gain. Choose healthier cooking methods – bake, boil, poach or grill food rather than fry. Choose healthy oils when cooking e.g. rapeseed oil and use sparingly. Substitute full fat for low fat products. Remember low fat dairy has the same amount of calcium as full fat dairy. Limit red meat intake – maximum 3 times per week. 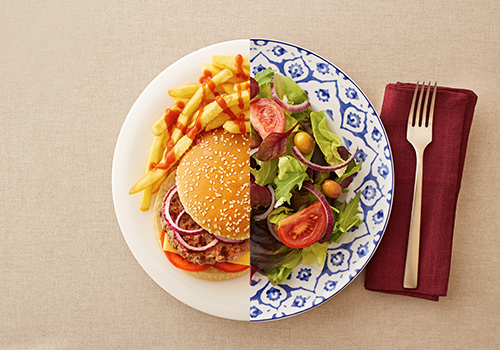 1 portion of red meat should be no bigger than the palm of your hand. Remember ham counts as a red meat! Replace red meat with chicken, turkey, fish, eggs or beans. Note: Low fat diary has the same amount of calcium as full fat diary. Focus on getting your calcium from low fat milk and yoghurts, as opposed to cheese. Posted in Health BlogLeave a Comment on What is fat ? Choking in any age group is a life-threatening emergency and must be recognised and responded to as quickly as possible. There may also be evidence that the person was eating before the onset of symptoms or in the case of children, they may have been playing with small objects. Tell them you are going to help. Stand closely behind the victim and wrap your arms around their waist. Locate the victim’s bellybutton in front; this helps with correct positioning for your fist. 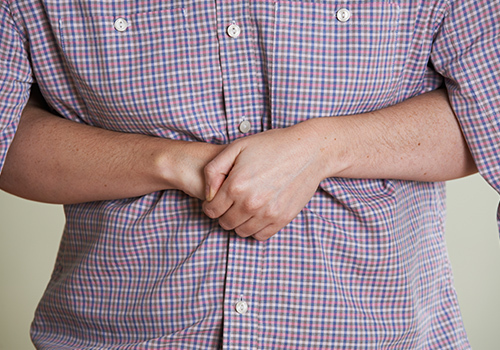 Make a fist with your other hand, turn it and place it thumb-side against the victim’s belly directly above the bellybutton. Start delivering quick inward and upward thrusts into the belly in order to create an upward force to help remove the object. Continue to deliver thrusts as many times as is necessary while the victim remains conscious. This technique, known as the Heimlich Manoeuvre must only be performed on a conscious choking victim. A choking infant may appear pale with bluish lips and cannot cry or breathe. Sit with the infant lying face-down along one of your arms using your thigh as a support, and ensure you support the infant’s head by placing your hand underneath the jaw. Keep the infant’s head low. Using the heel of your other hand, begin to deliver sharp back-slaps between the infant’s shoulder blades 5 times. If this is unsuccessful, turn the infant over onto his/her back along your opposite arm, supporting the head. Using 2 fingers, place them side by side in the centre of the infant’s chest and push downward 5 times. Continue to alternate between back-slaps and chest thrusts until you successfully remove the object and they can cry/breathe again. This technique should only be used on a conscious choking infant. If these techniques are successful, you should see the object eject forcefully from the victim’s mouth and they can begin to breathe/cough/speak again. It is advised to have the victim checked over by a healthcare provider. Remember, if any choking victim loses consciousness, becomes unresponsive and stops breathing normally, you must call 999 or 112 for an ambulance and begin to provide CPR until the ambulance arrives or the victim shows definite signs of life. To learn more about life saving training click here. “Healthy habits start at home, We want to help people establish a healthier way of life so they can be around to enjoy their families. Parents and grandparents can pass down a healthy legacy to their children and grandchildren – and we can help the next generation lead better, longer and healthier lives.” Dr. Rachel Johnson, Ph.D., MPH, R.D., Chairperson of the American Heart Association Nutrition Committee and Bickford Professor of Nutrition at the University of Vermont. Enjoy meals together. When everyone sits down together to eat, there’s less chance of children eating the wrong foods or snacking too much. Get kids involved in cooking and planning meals. Everyone develops good eating habits together and the quality time with the family will be an added bonus. Eating healthier at home starts with the ingredients you use. Many favorite recipes can be made healthier by substituting ingredients. 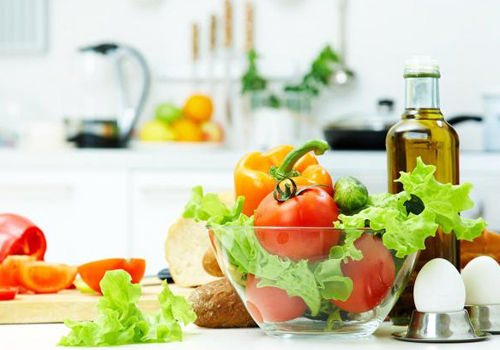 When you use oils for cooking, baking or in dressings or spreads, choose healthier oils — which include canola, corn, olive, safflower, sesame, soybean and sunflower oils. Limit added sugars in your family’s diet. Sugar-sweetened beverages are the largest source of added sugars for most of us, so reduce or cut out soda, sports drinks, energy drinks and fruit drinks as well as enhanced waters, sweetened teas and sugary coffee drinks. Drink more plain water instead. Try to reduce the amount of sodium you eat. If using packaged foods, compare food labels, and choose the product with the least amount of sodium. Use herbs and spices to add flavor when cooking, instead of salt. Eat more vegetables and fruits, whether fresh, frozen, dried or canned. Add them to dishes your family already loves and use them as healthier sides, snacks and desserts. If you choose canned, watch for added sodium and sugars. Darragh Kenny 4th Annual Memorial Cycle for Croí. Wind and rain did not stop family, friends and colleagues of the late Darragh Kenny come out in force on August 20th to support the 4th Annual Darragh Kenny Memorial Cycle. The charity event is organised by friends and family of the late Darragh Kenny who suddenly passed away in January 2013. Darragh worked as a prison officer at Mountjoy Prison, and many of his colleagues joined his family and hometown friends in the memorial cycle. 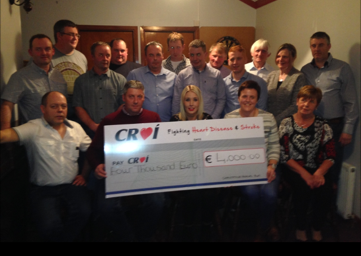 €14,210 was raised from this year’s event with the proceeds going to Croi Heart and Stroke to help the fight against heart disease and stroke in the West of Ireland. (L to R) Dermot Kelly, Liam Kenny, Ronan Gannon, Edwina Treacy (Croi Fundraising Manager), Nicola O’ Sullivan, Fidelma Kenny, Owen O’ Connor, Ciara Gallagher, Aidan O’Sullivan, Sarah Coffey and Gerry Kennan. Posted in NewsLeave a Comment on Darragh Kenny 4th Annual Memorial Cycle for Croí.